MOSCOW, October 15. /TASS/. 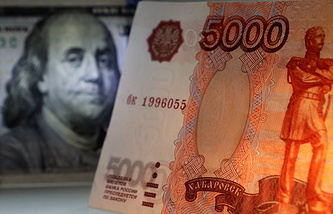 The floating ruble rate in Russia is ‘only on paper’ now but is actually replaced by regulation of the forex market by the Central Bank in order to mitigate financial stability threats, the Russian Accounts Chamber said in its conclusion for the draft Russian budget in 2019-2021. "Repeated case of interference of the Bank of Russia into implementation of the budget rule in terms of foreign currency purchases means that the floating currency rate regime existed from the end of 2014 until early 2018 is ‘only on paper now’ and is actually substituted by regulation of the currency market by the Bank for Russia for the purpose of eliminating threats for financial stability, jeopardized by the budget rule effect," the document says. Since dependency of the ruble on oil prices dynamics is gradually declining, other factors, both economic and foreign political ones, start playing greater role in its forming, the Accounts Chamber notes. Situations may occur again later on when oil prices and the ruble rate will have mixed dynamics and application of the budget rule instead of currency market stabilization will contribute to its imbalance, requiring interference of the regulator. "Related risks for financial stability actualize the issue concerning the potential revision of the budget rule and the need to identify the exchange rate policy of the Bank of Russia, pursued in the environment of repeated involuntary abandonment of the floating ruble rate regime," the authority says.